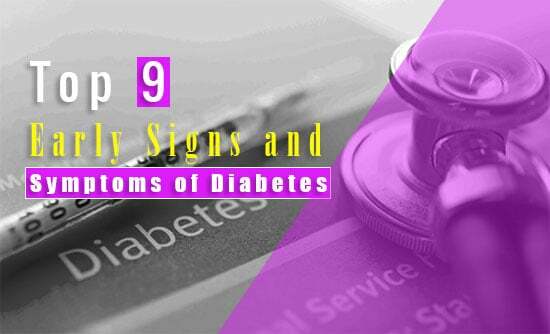 Top 9 Early Signs and Symptoms of Diabetes for All: MUST READ! Home » Health Tips » Top 9 Early Signs and Symptoms of Diabetes for All: MUST READ! Diabetes happens when our body falls into a problem with insulin levels. Our body’s insulin level may become seriously low or very high. Many reasons are involved in this health trouble like genetics, overweight, and diet. As a serious health concern, diabetes is affecting millions and millions of people in the world nowadays. Early signs and symptoms of diabetes (Type 1 and Type 2) are same. Type 2 diabetes could result in a few serious health problems. Therefore, it is very much necessary to diagnose some of the early signs and symptoms of diabetes. If you take the correct steps from the early stage, it could help in stopping these problems. Actually, type 1 diabetes occurs for the lack of insulin, as the insulin generating cells are damaged. On the other hand, type 2 diabetes occurs while our body’s cells become resistant to produce insulin. In fact, the cells of your body are not getting the glucose for its requirement, for this reason, your body will warn you some of the early signs and symptoms of diabetes. At this moment, you will go to the washroom too frequently due to excessive glucose in your blood. If insulin is useless, your kidneys will unable to filter glucose back to the blood. At that time, they become flooded out and draw out excessive water of your blood for diluting the glucose. Your own urinary bladder becomes full, so you go to the washroom too frequently. If you feel thirsty than normal, it can be one of the early signs and symptoms of diabetes. Particularly, it looks as if go the washroom too frequent for urination. At that time your body will pull extra water out of your blood and you go to the restroom more than normal. You will become thirsty to drink more water. Excessive high blood sugar levels in this situation can result in weight loss. Almost 10-20 pounds’ weight loss within 2-3 months. But this is not a healthy weight loss process. As the insulin hormone is not sending the glucose into the cells to use. You will feel hungry and start to break down protein from the muscles as an alternative source of energy. Also, our kidneys will not work actively for removing the too much sugar, and this is also a reason for burning extra calories. Feeling excessive hungry is one more early signs and symptoms of diabetes. As mentioned before, too much loss of sugar occurs repeated urination. That means, your body is losing calories. An unexpected weight loss will occur. But, this loss of calories will leave our body to feel very hungry. You will eat more to maintain the rotation. Feeling too much hungry all day long and other indications on this list will prompt you to visit the doctor. Read More: Health Benefits of Pomegranate: This Fruits Fight against Cancer, Arthritis, Type 2 Diabetes, Heart Disease, and More. Read how? The glucose from eating foods firstly go into your arteries, whereas insulin helps to change it into the body cells. The cells are created as energy, which we require for living. If your body’s cell does not react to the loss of insulin, the glucose will stay out the body cells in the blood. As a result, the cells will become hungry and you will feel exhausted and weak. Too much sugar in the blood can damage your nervous system, a condition called Diabetic Neuropathy. It is regarded as one of the main causes of numbness in hands and feet. At that moment, the individual should definitely go to a doctor. The nerves damage might be not adjustable in most circumstances. In this case, wounds and sores heal very slowly. This early signs and symptoms of diabetes might not be still unknown. But, do you know the reason behind it? The person with diabetes does not heal fast in wounds and sores due to the excessive sugar level in the blood delays the ability to heal. Actually, the person with Diabetes pulls out the liquid from the eyes, which occurs to blurred eyesight. And, if you don’t treat this condition over time, it could affect your eyes vessels, causes unclear eyesight or vision loss or even total blindness. Therefore, if you notice that your vision unexpectedly changes, they should visit your doctor. Read More: 12 Health Benefits of Lima Beans: Cure Breast Cancer, Heart Disease, Diabetes, Weight Loss and More! Among the above mentioned early signs and symptoms of diabetes, this might be ignored sometime. Actually, diabetes can weaken the ability to defeat germs of the human body, many of which are come through the mouth. Some problems raised in the mouth like puffy gums, the loss of jaw bone, tooth decay etc. If you had a dental problem before happening diabetes, you have to visit your doctor immediately as it doesn’t get worse. Diabetes is truly a severe health issue. If it becomes untreated, it might be dangerous. So, look into the early signs and symptoms of diabetes and confirm yourself to visit your doctor immediately.